Hey everyone thanks for joining us today we’re going to be looking at how to bridge the content gap. Pretty much a content gap is a difference between what people are looking for and the content that they’re finding online. This is a vital piece for a strong Internet marketing strategy and many companies fail to do this process and it costs them a lot of time and money. So, the first part we want to look at people and content, and this is understanding how people interact with content. Every Google search is a question, and this is important for marketers, as well as business owners, to understand this because the only way that you can improve your online presence is if you deliver high content for people. A content gap is when people can’t find what they want therefore there is a void in the market. Once you discover this difference, it is an excellent opportunity for you to adjust your marketing strategy and fulfill the needs of your audience. This means that you need to match the needs of your audience and drive business goals and this is where you start making money. Identifying a content gap isn’t easy, but there are specific tools that we’ll look at later and a particular process to help you with this process from start to finish. There’s four points to identifying a content gap. First, you want to focus on the topic that you want to talk about. This means that you have to be very specific so instead of talking about Nike shoes, it’s better to talk about women’s Nike shoes for running in the wintertime. This keyword phrase is a long tail keyword, and again what that long tail keyword identifies is a specific need for your audience. You can use professional tools to find out if there are women looking for Nike running shoes for the wintertime. The second part of discovering a content gap in your industry is to do market research to understand your audience. Keyword research is used to realize demand in your industry, and then you can use competitive analysis to understand supply. Market research is understanding the application of your audience. Competitive research shows the current supply of content in the market. This process helps you understand existing content and needs by understanding how your market and your competitors are working. Since this method encompasses all aspects of your marketing strategy, it is a vital piece for your business. 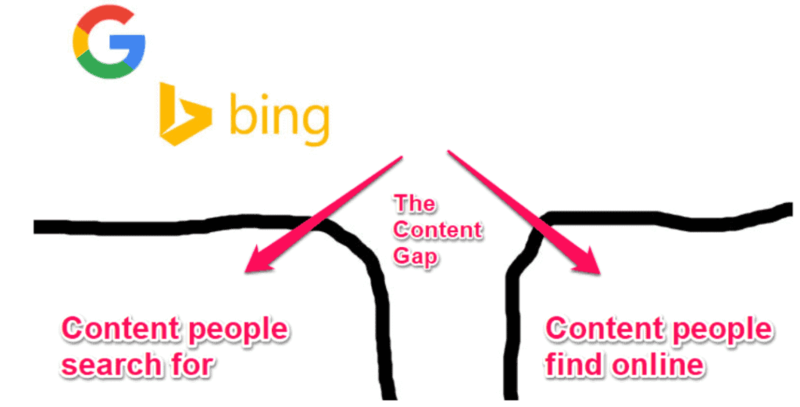 Here is a quick visual to show what a Content gap looks. On the left-hand side, you can see people go to Bing, Google, and other search engines to find content that they’re searching for. On the right-hand side is the goal for the content for people to see online. This area on the right is also the competitive part of the content gap equation. The drop off point in the middle is where the content gap exists, because if people search for something and they can’t find that content online. That shows a great opportunity through a content gap, and if you can fill that content gap, you can make a lot of money. The most important part of the content revolves around your customers. Market research shows that a real person is behind each online search. That’s very important for marketers and business owners to remember as they build a marketing strategy. Sometimes we can get stuck in the data, and we forget that real people have real problems that we’re trying to match. So, how do you find out the needs of your audience? Well, you could use tools like SEMrush, Ahrefs, and other professional tools to find kind of keyword research. We’ll talk about later, but there are different ways that you can do this research too. The best ways you can gather information about your customers is to use surveys and quizzes to understand what their needs are. If you identify that problem, then you can address their user intent. This means, like we talked about before, female running shoes for the winter time. We understand that that individual is searching for. This person is likely a female who likes to run, and it’s wintertime, or she’s preparing for that event. There are other variables- it could be a husband or a friend that’s looking for those items, but again, that’s where your ideal customer comes in. Using surveys to understand what that segment might seem like the why your customer is asking specific questions fuel your business. Your business can learn these insights through keyword research. People go to Google asking a question. With a specific search term, you know phrase, so keywords are only data points. That’s very important for marketers as well as business owners to remember, and key phrases show intent. Keyword research shows the demand of a topic, so higher demand means that there is more need or more need out there for that information. You need to know what your audience is asking, so this is where it comes back with surveys and looking at third-party data like SEMrush and Ahefs. These tools can help you find out what that need is and then another components. Where are your customers finding answers today? Competitive research helps you understand the content gap in a more in-depth context. Referring back to our visual we can see the right-hand side to understand what’s out there. With your competitors, it’s tough to dive into an oversaturated niche, and it’s going to cost a lot of time and money to tap into. This means that the content gap is mighty because you’re able to find a content opportunity that doesn’t currently exist. Current content that’s out there is the supply, and as part of a content gap analysis, you want to review the quality and quantity of content that already exists. The more quantity of specific content that is out there means that you are going to have to work harder. At the same time, the higher quality of that content that exists, the harder you’re gonna have to work to get noticed. Balancing this equation shows that your business needs to find that “seam” if you will. This seam will explain the easiest way to get your content seen based on the needs of your audience and the existing content that you will be going up against. If you understand who you’re writing for, what those people are searching for, and then what’s currently existing content that’s out there finding that difference, is how you can see a content gap. Once you find that gap, you want to focus on, and you want to drive every content marketing perspective that you have towards finding that goal. We talked a lot about the research tools you can look at SEMrush, Ahrefs, and local search. Local search is especially important if you’re a brick and mortar store. A great way to go about it is to look at anything that’s in your city and get in contact with your community. So there you have it. In a little under seven minutes, we broke down how to identify, optimize, and fill a content gap for your business marketing strategy. If you have any questions feel free to reach out, you can contact me at [email protected]. You can leave a comment below, and I have tried my best to answer those. I’ll also be linking out to a lot of significant resources that you can continue the journey and understanding and research of a Content gap. Thanks a lot for joining us today and we look forward to seeing you in the next video and talking with you about how you can grow your small business or startup. Be sure to leave a like, comment, and subscribe. That helps us out a lot, and we look forward to seeing you in the next video. Thanks!